jonathan schork was born & raised in new york state's hudson valley. He was heavily influenced early on by the exquisite & complex forms he found in forests & mountains, as well as the encouragement of his parents, Fred & Carol Schork, & others in his community. A move to his solar house in the Florida Keys in 1996 expanded his influences to include ocean & sky. The opening of the first schork~munsell studios in 1998 with his late wife, Mary Cooke Hoeft, officially brought him into the world of professional arts. The second sm studios were opened in Key West from 2004-2006, and a third-- unofficially-- in South Beach, FL, from 2006-2009. The sms2 opened near St. Petersburg, FL, from 2011-2014. Presently working privately out of his home, schork continues to produce prodigiously. A relentlessly curious polymath, he works across a wide and varied spectrum of media. In much of his artwork, schork uses foreign languages in his titles. While it has been explained to him that this is a habit of bad artists who make bad art, schork offers a very simple explanation: "I love language-- any language. To be able to communicate with someone who may not speak your native language is a beautiful thing. I can communicate competently in English, Russian, French, & German, & incompetently in Japanese, Latin, Spanish, & Italian, but I borrow a lot of influences from some of those cultures (especially Latin, Japanese, & French), and feel very strongly that to entitle a piece with its source language pays homage to that culture. If an unexpected consequence is that my audience picks up a few words from another language, so much the better. To disqualify artwork or an artist because he uses a foreign language seems ignorant & dismissive to me." 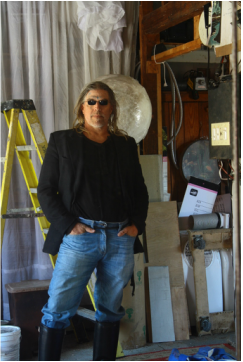 Fine Arts: schork has shown and won awards at the public expo SculptureKeyWest, participated at burning man as an artist, theme camp operator, filmmaker, & journalist since 2006, and has monumental sculptures on display throughout the southeastern U.S. An occasional iconoclast, schork is comfortable using a variety of materials to accomplish his work, so a ship might have no hull, steel masts, & sheer organza sails. Light & sound are also frequent components he includes in otherwise static work. "I consider myself an alchemist in my sculpture works," schork writes, "I turn a thing into another thing." Music: beginning in childhood with a cello (to which he candidly admits frustration & a lack of success), schork has always reserved a special affection for music. He played in the Giri Mekar Balinese Gamelan orchestra in Woodstock, N.Y. from 1993-1996, created his own experimental group-- the dead word whisperers-- in Key West in 2007, and continues to study in both classical & electronic media. Using his knowledge of musical theory, he presently designs & builds experimental instruments & monumental, playable sculptures. Literature: a prolific writer, schork has offended nearly everyone he knows, including family, with his articulate & sometimes abrupt essays on social ills, including the unreflective use of profanity in public places, lack of personal responsibility, the failing U.S. education industry, a runaway entitlement culture, & lack of community participation. In the late 1990s he wrote a column on human rights for the Key West weekly Celebrate!, & in 2009 wrote on food, fashion, & culture for the Hawai'i-based fashion magazine DISfunkshion. As noone, perhaps, he maintains an international travelblog. in 2004, with E.C.Kasteen, he coauthored the short-story book diversifolio (Seastory Press, Key West, FL). He has also written numerous screen plays for his film division, jonathanschork films, and stage plays for local theatre companies. For a more complete list of his books, please visit his "library" page.